[dropcap]T[/dropcap]he boys’ golf team [9-2] took home a second place finish April 23 in the Capital City Invitational. 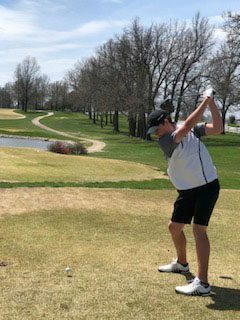 The match was held at Meadow Lake Acres Country Club in New Bloomfield, Mo., and featured teams from the Hickman, Helias, Jefferson City and Rockhurst high schools. The team shot a combined score of 319, with senior Hudson Dubinski finishing in first place among all individuals with a score of 74. It was the first match of the season where the team did not finish in first place, and head coach Austin Reed hopes the Bruins received a wake-up call from the end result of the match. During the match, Reed tried to motivate the players by only using positive encouragement. He thought it was best if he didn’t ask about how they were playing and, instead, attempted to keep the players light and loose. While junior Ross Steelman did not have the round he wanted or expected, he appreciated Reed’s positive company. Reed’s encouragement might have made Steelman’s score of 80 seem less disappointing, but Steelman plans to ensure he never plays the way he did during Tuesday’s match. Fellow junior Keith Schaezler also did not have a great showing during the match. Schaezler struggled with adapting to the green speeds, much like Steelman, but hopes he can continue to improve in this aspect of his game. Even though Schaezler’s drives were not great throughout the round, he credits his strong chipping for saving a part of his round. Schaezler and Steelman will need to gather themselves quickly in order to play well in their last match of the regular season. The match will be held today April 25 at the Old Hawthorne Country Club in Columbia, Mo. Ryan Choe is a sophomore at RBHS and is an active member in the RBHS chamber orchestra and boys golf team. In his spare time he can be found watching college and professional sports, practicing cello and golf, and (most often) doing homework.